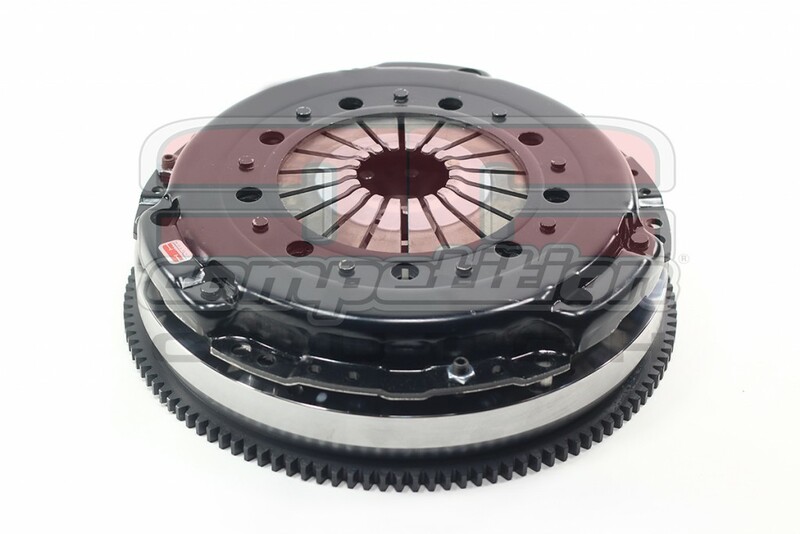 Competition Clutch now offers a Multi-plate Clutch Kit with Flywheel for the Toyota Supra utilizing the V160 Transmission. This kit provides a drastic increase in horsepower holding capacity with excellent drivability characteristics. The construction of this twin disc provides the ideal balance of sport driving and daily driving clutch use. Many new features are responsible for these positive attributes. Two 240mm full faced discs are used in conjunction with a performance pressure plate, thereby providing additional friction area for enagement. The full faced discs are offered in either organic with steel back brass material or segmented ceramic options. The standard “pull style” release system has been redesigned to utilize a hydraulic “push style” release system. This provides a more consistent pedal feel and smoother load transfers between shifting engagements. The steel flywheel is CNC machined and balanced. All clutch kits are provided with an alignment tool, pilot bushing and a hydraulic throw-out bearing. Assembly comes complete with the pull to push conversion kit.